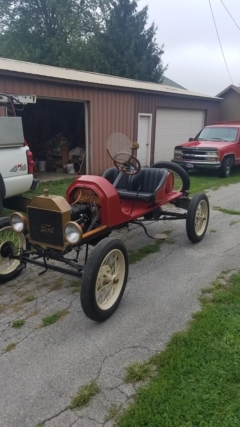 Model T Ford Forum: Speedster day! Model T Ford Forum: Forum 2018: Speedster day! Today I had a chance to pass on some knowledge I have soaked up while reading this forum and fumbling through getting my RPU on the road. My employer and good friend for 18 years before I took over the businass in 2007 has a speedster that he got in a trade for a jet ski about 20 years ago. Now he has tinkered with it but never really got serious about getting it going. He said it over heated all the time and he installed a new water pump to solve what I told him was probably fuel and timing related. Today we both had time to go look at it. 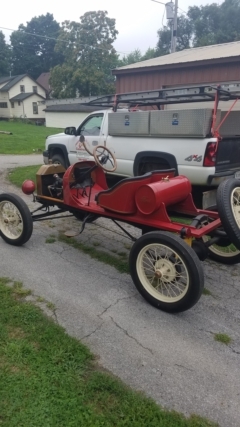 This is titled as a 15 but has a 26-7 chassis and engine. The battery was dead and it hadnt been started in a year. I gave it a once over and we put in some gas. Oil and water was good. I set the carb at 1 1/2 turns and advanced throttle a bit. Timing lever all the way up. Pulled choke and two pulls up on crank. I tolg him to turn on the switch. The second pull on the crank and she roared to life! He was totally amazed! I tinkered with the carb and timing till I found the sweet spot. I checked out all gears and brakes and we were ready to let it off the blocks. I hopped in with him riding shotgun. Out into the alley we went. I turned left toward the street and I hit the brake . The steering wheel kept turning around and around to the left. It would turn right as soon as I turned wheel but I told him something is wrong. I got out and looked it over and decided that a trip around the block would be ok. After a few trips around the block and maybe the next one to I let him drive after a quick lesson. We switched places and we were off again. He overshot the alley and had to back up. After stopping he killed it in the middle of the street. Another pull of the crank and he killed it again. I ended up driving it back to garage. The radiator was over full for my liking but it never spit any water, not even after we shut it down. He said he could never keep it running long enough to drive it. I have to do some reading to see why steering is not right. Its real squirlly going straight down the road. The ball on the " drag link" that attatches to steering arm is worn pretty bad. When turning right the steering stops as it should but turning left the wheels turn all the way but the steering wheel just keeps turning after wheels are all the way left. About 1/2 a turn of the wheel back to the right and the wheels start to go right. The wood trunk and hood are not on the car but they look as nice as the rest. You probably have the wrong length drag link ( too short) It sounds like it is going past center, so it is trying to reverse steer. Also the steering box ( right under the steering wheel should have a long stop pin in one of the planet gears that will limit the rotation). Dallas, John may be on to something, but not all steering boxes had the slot and extended planetary gear pin. Earlier columns had no slot at all. If the top is screwed off, you should be able to ascertain what you are dealing with. With the problems you describe, I would not be driving the car on the road. Thanks guys. I think the toe is wrong also because on the straight it is all over the road. I told him we need to work on steering. It is going over center. I can see it when turned all the way left. I will get some photos of steering and post them. Dallas,A lose radius rod will also do the same.That lesson cost me a 35.00 fine when that was a lot of money! The cop said the plate belonged to a 1966 Mustang.No wiser just older Bud. I'm with Allan. Get the steering sorted out before you drive it. Bad steering can put you in the ditch before you know what's happening. If part of the trouble is poor alignment, that can eat up your front tires in short order. Make sure that there is a woodruff key in the steering shaft / pitman arm connection and that the grooves are in good shape ant the nut is tight and has a cotter pin. One of my T's started getting squirrely and I noticed that the pitman arm nut was loose even though it had a cotter pin in it. I started to just tighten it up, but then decided to take the nut off and look at the shaft and taper first. That's when I discovered that there was no key in the slot! Could have been a disaster, even deadly!